A Ouadah, D Zahedi, R Perumal. Animal Melioidosis Surveillance In Sabah. The Internet Journal of Veterinary Medicine. 2006 Volume 2 Number 2. Melioidosis is an infectious disease of public health importance which it was first described in Malaysia in 1913 among laboratory guinea pigs and rabbits; though the disease was first reported in breeding stock of pigs imported from Australia in 1963 in Sabah. Infection occurs in different animal species, most frequently terrestrial and marine mammals both in domestic and wild animal with chronicity, silently and wide range of symptoms. The transmission of the pathogen B.pseudomallei and the fluctuation on melioidosis frequency during dry and wet seasons are strongly gathered and supported by environmental factors such as temperature, rainfall and different soil type's compositions. Melioidosis is a zoonotic infection of public health importance. It is described most often in domestic animals and humans in Southeast Asia and other parts of the world (Puthucheary et al, 2001; Jones et al, 1996). It is an emerging infectious disease with serious public health implications in most countries (Center for Food Security and Public Health, 2003). Transmission occurred when infected animal body fluids such as urine, milk or nasal secretion or blood came into direct contact with susceptible hosts depending on the site of infection or through contact with infected soil or water (Center for Food Security and Public Health, 2003; Jayaram, 2000; Bettey et al, 2002; May-Ann et al, 2000); as well infection appears to be the inhalation and aspiration of contaminated dust particles (Weber et al, 1969; Mackowiak et al, 1978; Thomas et al, 1988; Howe et al, 1971). Moreover, infection has been reported through contact with contaminated domestic and medical appliances (Mccormick et al, 1975; Schlech et al, 1981), and trans-placental (Thomas et al, 1988; Jodie et al, 2000), nosocomial (Jodie et al, 2000; Sookpranee et al, 1989) or sexual (Currie, 2000b) has been also reported. The incubation period of melioidosis is not clearly defined but may range to one to 21 days (Ian, 2002; Leelarasamee, 2000). In Malaysia, melioidosis was mostly common discovered in variety livestock such as goats, cattle and pigs. The earlier case was reported in Kuala Lumpur, a cat in 1918, where it was died after illness of three days suffering with dysentery, vomiting and prostration. Melioidosis in Sabah was first reported in breeding stock of pigs imported from Australia in 1963 in Keningau (Sabah, 1963). Subsequently in 1965, B.pseudomallei was isolated from an autopsy on a captive female orangutan that died of melioidosis in Sandakan (Spencer and Robert, 1978). Later investigation by the local health authorities and institute of IMR of Malaysia demonstrate the presence of the causal organism B.pseudomallei in the environment. Common symptoms of melioidosis in animal were anorexia, pyrexia, hyperthermia and cough; skin dehydratations were often seen. During the early infection, disease progress silently for a considerable period and often resulted in death but symptoms and disease progression is different from species. Goat melioidosis runs more chronic, silent progression with unusual progressive emaciation and inanition (Vellayan, 1994). Both acute and chronic forms occur in sheep are very similar to those in goats, whereas some show nervous signs; paraplegia. Melioidosis in equidae is rare where B.pseudomallei was isolated five specimens of coughed thick pus (Lancaster, 1955). By the other hand, the disease manifests more acutely in young pigs, rather than in adults' melioidosis run more chronically (Omar et al, 1962). 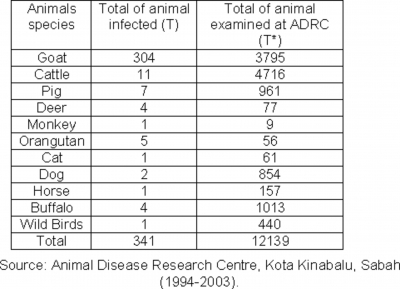 Animal Disease Research Centre (ADRC) in Kota Kinabalu, Sabah records showed the most common disease was pasteurelosis followed by melioidosis during the period between 1994 and 2003. Through the data on animal melioidosis were obtained from ADRC records for the period 1994 to 2003 showed three hundred forty one (341) melioidosis cases were identified from 12139 at post-mortem (Table 1). The post mortem examination revealed lesions in liver, spleen, kidney, cardiac and respiratory systems, skin, muscle, and lymph nodes. Liver, spleen, tracheal and bronchial tubes were congested often with multiple abscesses; also focal subcutaneous and muscle haemorrhages and dilatation of the heart seen. In fact, ante mortem studies showed different symptoms between animal species, even the symptoms are varied in different species of Zoo animals (Vellayan, 1994).Common symptoms seen were anorexia, pyrexia, hyperthermia and cough; skin dehydratations were often seen; on the other hand, various ages of animals were infected but the disease is more acute and fatal for young animals. The ratio of 7: 5 between males and females, it seems that females were most frequently infected than males. Table 1 showed that the disease affected most frequently animals living forest or according to their active behaviour such as monkey (11.11%), orangutan (8.92%), goat (8.01%) and deer (5.19%) and less often for captive animal; big ruminant and non-ruminant such cattle (0.23%), buffalo (0.39%), horse (0.63%), pig (0.72%), as well as wild bird (0.22%). Veterinary records showed as well that large ruminant such as cattle and buffalo were rarely seen infected with melioidosis. Perhaps, the inactive behaviours of these animals on pasture lessen the contact with the disease agents. Also, the animal may have develop some tolerance or resistance to the bacteria, e.g buffaloes are semi-aquatic spending a large part of their time either in water or swamp wallows, thus protecting skin injuries or abrasion from infections. Dogs and cuts were rarely reported with melioidosis; though in ADRC had one cases in cat (1.63%). It is believe that is an unusual case. ADRC had reported no melioidosis cases for domestic birds during past ten years in Sabah. It was suggested though not yet proven that domestic chickens are resistant to melioidosis (Stanton and Fletcher, 1932; Lim et al, 1967). B.pseudomallei is a facultative organism, often found in the environment especially in the soil (Currie et al, 2002). It is believed that the dispersion of B.pseudomallei is often influenced by natural environmental factors such as the temperature, rainfall and humidity, and also to the soil micro environment (Frederick, 1997). An infected animal can contaminate and maintain organisms in the soil for a very long period of time. Figure 1 shows periodic variation in the frequency of animal melioidosis in Sabah during a period of 10 years. 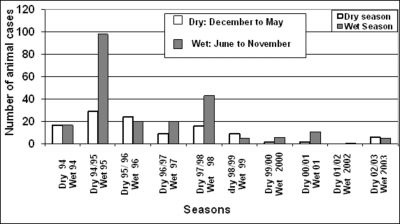 It is apparent that during the wet seasons there are high melioidosis frequency with the exception of the year 1996, 1999 and 2003 dry seasons. The epidemiologic inspection study of the disease during the wet and dry season had mostly high frequency of melioidosis in caprine specie with fluctuation other animal species. The high rate of culture positive animals during 1995 and 1998 wet season could be featured to intensive environmental factors influence the dispersion of B.pseudomallei that reflected by the number of cases seen during the wet season. 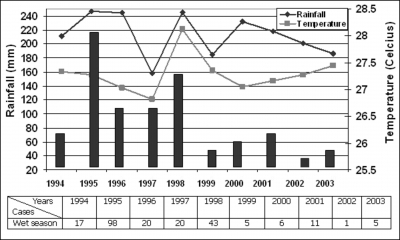 High temperature and low raining at dry season graphs showed these two parameters run approximately opposite and low disease incidence through that period (Figure 2); only on 1995 and 1996 had moderate melioidosis frequencies. 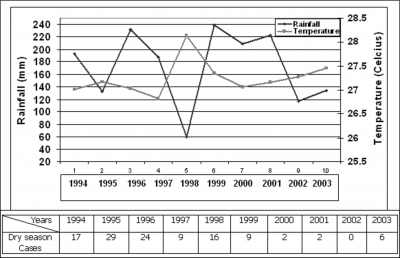 However, graph of low temperature and important rainfall in figure 3 runs almost on parallel from 1994 to 1999, and during that's period highest melioidosis frequency with maximum peak in 1995 rather than the next period from 2000 to 2000 which the two environmental parameter run on opposite as consequences to low melioidosis frequency. The analyzed data shown that during the dry season December till May, there were weak negative correlations both for temperature and rainfall respectively (y = -2.1199x + 94.756; R 2 = 0.0011; r = -0.03), (y = 0.0082x + 38.407; R 2 = 0.0004; r = -0.02) and melioidosis. Otherwise, the analysed data shown that during the wet season June till November, the disease had weak positive correlation with temperature (y = -0.0082x + 38.407; R 2 = 0.0004; r = -0.02) and moderate positive correlation with rainfall (y = 0.3783x – 41.55; R 2 = 0.2347; r = +0.48). Middling melioidosis is an infectious disease of public health importance, and infect most often terrestrial and aquatic mammals, especially in Southeast Asia and other parts of the world. Malaysia is a tropical country rich on biological diversity; which the environmental factors encourage high levels of biodiversity in hosts, factors, B.pseudomallei support transmission of the pathogen from host to host or environment factors to the host. It is obvious that there was decrease in melioidosis cases in animal with increase in environmental temperature, in reality; it is seems that dry environment does not encourage transmission of the disease among animal. Conversely, it is suggested that that wet environment predisposes animal to a higher exposure of getting infection, possibly from contaminated soil. We thank Mr. Awang Sahak Salleh and Dr. Nasip Eli from Department of Veterinary Services and Animal Industry, and Animal Disease Research Centre in Kota Kinabalu, Sabah for providing the data required for this study. Also we thank Jabatn Hidrologi dan Perkhidmatan Kajicuaca Malaysia. 1. Bettey, A; D. Forbes; F. Sahm. and S.W. Alice (2002). Diagnostic Microbiology. United State of America: Andrew Allen (Mosby). 3. Currie, A; F. Dale; A. Nick; H. Sarah; H. Marilyn; et al (2002). Melioidosis - a dry wet season results in fewer Top End cases. The Northern Territory Disease Control Bulletin. 9(1): 1-2. 4. Currie, B.J. (2000b). The epidemiology of melioidosis in Australia and Papua New Guinea. Acta Tropica. 74: 123-127. 5. Frederick, A.M. (1997). Melioidosis, in H.C. Daniel; W.C. Francis; J.M. Jerbert; J. Kevin; A.S. David. and E.L. Ernest (eds.). Pathology of Infectious Diseases. Library of congress: Simon and Schuster Company. 6. Howe, C; A. Sampath; and M. Spotnitz. (1971). The pseudomallei group: a review. Journal of Infectious Diseases. 124: 598-606. 7. Ian, H.M. (2002). Melioidosis- A Rare But Serious Tropical Disease That Could Affect Travellers. The Pharmaceutical Journal. 268: 849- 851. 8. Jayaram, P.C.K. and R. Anathanarayan (2000). Textbook of Microbiology. India: Orient Longman Private Ltd.
9. Jodie, L.C; M. Mark; J. Anton; B.J. Currie. (2000). Animal melioidosis in Australia. Acta Tropica. 74: 153-158. 10. Jones, A.L; T.J. Beveridge; D.E. Woods. (1996). Intracellular survival of Burkholderia pseudomallei. Infectious Immunology. 64: 782-790. 11. Lancaster, W.E. (1955). Federation of Malaya Report on the Veterinary Department for the year 1953. Malaya: Government Press. 12. Leelarasamee, A. (2000). Melioidosis in Southeast Asia. Acta Tropica. 74:129-132. 13. Lim, S.Y. and B.E. Tan. (1967). Actinobacillus isolated from a parrot. Kajian Veterinaire. 1: 44. 14. Mackowiak, P.A; J.W. Smith. (1978). Septicaemic melioidosis occurrence following acute Influenza A, six years after exposure in Vietnam. The American Medical Association. 240: 764-766. 15. May-Ann, L. and L. Yichun. (2000). Sequencing and characterization of novel serine metalloprotease from Burkholderia pseudomallei. Federation of European Microbiology society. 192: 67-72. 16. Mccormick, J.B; D.J. Sexton; J.G. McMurray; E. Carey; P. Hayes; R. Feldman. (1975) Human-to-human transmission of Pseudomonas pseudomallei. Annual International Medicine. 83: 512-531. 17. Omar, A.R; K.K. Cheah. and T. Mahendranathan. (1962). British Veterinary Journal. 118: 421. 18. Puthucheary, S.D; J. Vadivelu; K.T. Wong; G.S.Y. Ong. (2001) Acute Respiratory Failure in Melioidosis, Singapore Medical Journal 42(3): 117-121. 19. Sabah. (1963). Annual Report. 20. Schlech, W.F.III., J.B. Turchik; R.E.F. Westlake; G.C. Klein; J.C. Band. and R.E. Weaver. (1981). Laboratory-acquired infection with Pseudomonas pseudomallei (Melioidosis). National English Journal of Medicine. 305: 1133 -1135. 21. Sookpranee, M; P. Lumbiganon. and P. Boonma. (1989). Nosocomial contamination of Pseudomonas pseudomallei in the patient at Srinagarind Hospital, in S. Punyagupta; T. Sirisanthana. and B. Stapatayavong (eds. ), Melioidosis. Bongkok: Bongkok Medical Publisher. 22. Spencer, K.P.K. and W.W.K. Robert. (1978). Melioidosis presenting as prostatitis- A case report from Sabah. Transaction of the Royal Society of Tropical Medicine and Hygiene. 72(5): 522-524. 23. Stanton, A.T. and W. Fletcher. (1932). Melioidosis. Studies from the Institute of Medical Research of Federated Malay States, London: John Bale & Sons and Danielson. 24. Thomas, A.D; J.C. Forbes-Jaulkner; J.H. Norton. and K.F. Trueman. (1988). Clinical and pathological observations on goats experimentally infected with Pseudomonas pseudomallei. Australian Veterinary Journal. 65: 43-46. 25. Vellayan, S. (1994). Zoo Animal Clinic. National Zoo, Malaysia, Selangor, Malaysia. 26. Weber, D.R; L.E. Doughlass; W.G. Brundage. and T.C. Stalkamp. (1969). Acute varieties of melioidosis occurring in US soldiers in Vietnam. The American Journal of Medicine. 46: 234-244.